The NBA comes to London this weekend when the New Jersey Nets and Toronto Raptors square off in the O2 Arena – but how far are we from having an NBA team based in Europe? 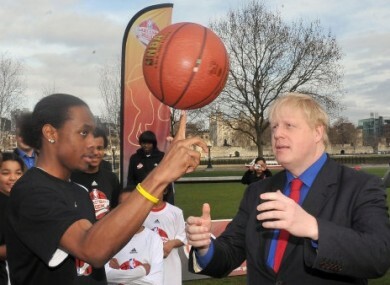 Mayor of London Boris Johnson learns basketball skills from Malcolm Jones, 16, of the Merton Hawks. NBA COMMISSIONER DAVID STERN has talked about having NBA franchises in Europe within a decade for so long that it seems it’s been more than 10 years by now. Times have changed since he first started making the prediction, so much that there’s more talk these days about eliminating teams than adding new ones. The league still believes it can get there someday, but in the meantime there’s building to do, and that includes everything from arenas to fan bases. The next phase comes this week, when the New Jersey Nets and Toronto Raptors the play league’s first regular-season games in Europe. “We think it’s the perfect time and bringing regular-season games to Europe is really the next step in the development of our fan base,” NBA International President Heidi Ueberroth said Wednesday. The Nets and Raptors will play games Friday and Saturday at London’s O2 arena, where the league has previously staged exhibition games. Ueberroth said the game Saturday was already sold out and expected the opener to get there. There have been exhibition games throughout Europe in recent years, and those will surely continue. But with London set to host the Olympics next summer, the NBA decided it was time to play some games that count. Preseason games are very successful, we’ll continue to look at those. But we saw an opportunity here and we’ve got two teams that are very interested in coming here and playing games. It really seems like a natural development and the right thing to do at this time. Though the struggling Nets and Raptors would have trouble filling an arena in North America, it’s a good matchup for Europe. Toronto has six international players, the most in the NBA. New Jersey, now owned by Russian billionaire Mikhail Prokhorov, has shown a willingness to travel in his quest to build a global fan base, and has some rare buzz after its surprising trade for All-Star point guard Deron Williams last week. Along with the games, the league is hosting various clinics, competitions and other fan events throughout the week as it tries to figure out exactly how much passion there is for the NBA in Britain. The NBA announced this week that there would be NBA, WNBA and U.S. men’s and women’s Olympic exhibition play in Manchester, England, over the next two years. London’s O2 arena is regarded as one of the few NBA-ready arenas in Europe, which has been one of the greatest obstacles to any expansion plan. There has to be enough teams so that clubs can go there for an actual road trip, where they would play a few games before returning to North America. There still aren’t enough buildings to house those teams, and the collapse of the worldwide economy probably slowed any hopes more would be constructed any time soon. So the NBA is doing what it can for now, opening offices in major markets throughout Europe to expand its presence on the continent. To get to a point where we have franchises, we have to have all of the things add up, including the arenas. For us, it has to be a series of steps, including fan affinity. The NBA has staged 51 preseason games in 18 European cities. When the NFL and NHL recently started playing regular-season games there, Stern said that would be no great achievement for his league, noting it played games in the regular season in Japan all the way back in 1991. Besides, the goal was never just to have games in Europe, it was to have teams. Perhaps this week gets the NBA a little bit closer. “We certainly think at some point in the future there’s an opportunity for that. Again for us, the immediate focus is about the engagement and we’re very pleased with the growth that we’re seeing,” Ueberroth said. Email “NBA chiefs still dream of European franchises”. Feedback on “NBA chiefs still dream of European franchises”.